Non-Hodgkin lymphoma, also known as NHL, is a type of cancer in your lymphatic system (your lymphatic system helps to fight infections). Like all cancers, it’s caused by an abnormal and uncontrolled growth of cells. Around 13,000 people are diagnosed with non-Hodgkin lymphoma in the UK every year. Most people who are affected are over 50 years old, although NHL can develop in children too. The main treatments include chemotherapy, radiotherapy and monoclonal antibody therapy. Your lymphatic system is part of your immune system. It includes your bone marrow, spleen, thymus and lymph glands (nodes). Your lymph glands make and store cells ready to fight any infections you might get. These cells are white blood cells called lymphocytes. Your lymphatic system also includes lymph vessels, which carry and recycle fluid (known as lymph fluid) in your body. 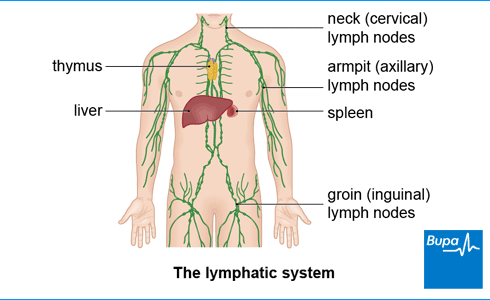 The image below shows where the main glands, organs and vessels of your lymphatic system are. There are groups of lymph glands in your neck, armpit and groin. You may be able to feel some of them under your skin. There are deeper lymph glands in other areas of your body, such as in your abdomen (tummy), pelvis and chest, though you can’t feel these. There are many different types of cancer (malignant tumour) that can form in the lymphatic system. These are called lymphomas, and the main ones are Hodgkin lymphoma and non-Hodgkin lymphoma. Lymphomas happen when the white blood cells (lymphocytes) that help fight infection become abnormal and turn into cancerous cells. A lymphoma can start in a group of lymph glands almost anywhere in your body. It can also start in one of your lymph organs; for example, in your spleen or thymus. Sometimes, but not often, the cancer can start outside your lymphatic system such as in your liver. See our FAQ: Hodgkin and non-Hodgkin lymphoma for more information about the difference between the two. There are many different types of non-Hodgkin lymphoma, which look different under the microscope. They are separated into two categories called low grade and high grade. primary mediastinal large B-cell lymphoma. For more information about the difference between low and high grade lymphomas, see our FAQ: Low and high grade. natural killer cells (which may fight infected cells directly). Non-Hodgkin lymphomas that affect B cells are most common. Your doctor will explain which type of non-Hodgkin lymphoma you have and which course of treatment is right for you. Treatments vary depending on which type of lymphoma you have. The symptoms of non-Hodgkin lymphoma vary depending on the type of lymphoma you have. Not everyone has symptoms. The main symptom is a swollen lymph gland (in the neck, armpit or groin). Where you may have or feel symptoms depends on where in your lymphatic system the cancer has developed. You might have an enlarged spleen or liver, or tonsils. You may feel out of breath if the lymph glands in your chest are affected. You might have a lump in your tummy if the glands there are enlarged. These symptoms aren't always caused by non-Hodgkin lymphoma, but if you have them, see your GP. To diagnose non-Hodgkin lymphoma (NHL), your GP will ask about your symptoms and examine you. They’ll also ask you questions about your medical history. Some of the symptoms of NHL are non-specific, which means they could be caused by something else. Depending on your symptoms, your GP may organise some initial tests such as blood tests and a chest X-ray to check for other possible causes. If your GP then suspects you could have non-Hodgkin lymphoma, he or she will refer you to a hospital specialist for further tests. If you have swollen glands and your GP suspects it could be NHL, it’s likely that he or she will refer you to a specialist at hospital for further tests straightaway. You’ll usually get an appointment within two weeks (or two days for children). Further tests may include having scans (such as a CT or positron emission tomography (PET) scan, or ultrasound). These are all to look at the inside of your body. You may have a biopsy, where a sample of skin tissue, lymph gland or bone marrow is taken to look at under a microscope. If you have a biopsy taken, this may be done under local or general anaesthesia. If you’re diagnosed with non-Hodgkin lymphoma, tests will look at whether or not the cancer has spread and how big it is. This is described by the ‘stage’ of the disease; from stage 1 (the cancer has stayed within the organ it started in) to stage 4 (the cancer has spread from where it started to another part of the body). See Related information for explanations of the terminology used in cancer. Your treatment will depend on the type of non-Hodgkin lymphoma you have and whether or not it has spread. The main types of treatment are chemotherapy, radiotherapy and monoclonal antibody therapy. You may receive more than one type of treatment. They’ll explain your treatment options and help you make treatment choices that are right for you. After treatment, your team will assess whether or not there are any remaining signs of your cancer. If there are, you’ll need to have more treatment. You’ll have regular check-ups with your doctor to check for any signs of the cancer returning. Your follow-up plan will depend on the type of non-Hodgkin lymphoma you had. Over six out of every 10 people diagnosed with non-Hodgkin lymphoma are predicted to survive at least 10 years after their diagnosis. The chances of your treatment being successful will depend on the type of non-Hodgkin lymphoma you have. Not all non-Hodgkin lymphomas need treatment immediately – your doctor may suggest a watch-and-wait approach. This means that you will be monitored but won’t receive any treatment. People who wait until they need treatment live just as long as those who start treatment straightaway. And there are other benefits such as not having the side-effects from chemotherapy. Your doctor will explain more about watchful waiting and if it’s appropriate for you. Chemotherapy uses medicines to destroy cancer cells. These medicines are usually given by a drip into a vein in your arm. You may be given a few different medicines over a few months. You won’t receive the medicines everyday – you’ll have breaks to allow your body to recover from the side-effects of the medicines. See our information on chemotherapy to learn about the side-effects of the treatment. Sometimes you may take steroid medicines (e.g. prednisolone) alongside your chemotherapy. These medicines help the chemotherapy to work and you usually take them as tablets. You may also have a monoclonal antibody therapy called rituximab with your chemotherapy (see Monoclonal antibodies). Radiotherapy uses X-rays to destroy cancer cells. A radiotherapy treatment only takes a few minutes. A beam of radiation is targeted to the cancer to shrink it. Depending on the type of non-Hodgkin lymphoma you have and its stage, you might have radiotherapy after your chemotherapy. You’ll need to go to the hospital for radiotherapy treatment, usually from Monday to Friday, and then have a rest over the weekend. Your doctor will let you know how long they expect you’ll need treatment for. Monoclonal antibodies are medicines that can recognise and target cancer cells. Rituximab is a monoclonal antibody that is used to treat many types of non-Hodgkin lymphoma. It’s given through a drip into a vein or as an injection. Rituximab is often given with chemotherapy. If your first chemotherapy for non-Hodgkin lymphoma hasn’t worked well or if you have relapsed following your initial treatment, you may need a higher dose of chemotherapy. This kills off any remaining NHL cells. It also kills your stem cells which your body needs to make blood cells. To stop you becoming unwell, you will have a stem cell transplant. This is an injection of stem cells into your body to replace the ones you lost. Your body will use the stem cells to make new blood cells to replace the ones the high-dose chemotherapy destroys. Your stem cells will be collected before you have the high-dose chemotherapy. High-dose chemotherapy and stem cell transplants aren’t used for all types of non-Hodgkin lymphoma. For more information about stem cell transplants, see our FAQ: Stem cell transplant. What’s the difference between Hodgkin and non-Hodgkin lymphoma? What’s the difference between Hodgkin and non-Hodgkin lymphoma? Hodgkin lymphoma isn’t the same as non-Hodgkin lymphoma. It’s a different type of lymphoma. They are both cancers of your lymphatic system but these two types of lymphoma develop and spread differently, and they are treated in different ways. There are six types of Hodgkin lymphoma and 61 types of non-Hodgkin lymphoma. Hodgkin lymphomas involve a particular cell type called Reed–Sternberg cells. The two types of lymphoma can be told apart by looking at the cells under a microscope. Hodgkin lymphomas aren’t as common as non-Hodgkin lymphomas. It’s estimated 2,000 people are diagnosed with Hodgkin lymphoma in the UK every year, compared with almost 13,000 people diagnosed with non-Hodgkin lymphoma. Anyone can get either type of cancer but Hodgkin lymphoma is more common if you are around 25, or 50 to 60. Non-Hodgkin lymphoma is more common in older people, aged 50 and over. See our Hodgkin lymphoma topic for more detail about this type of cancer. What do low grade and high grade non-Hodgkin lymphoma mean? What do low grade and high grade non-Hodgkin lymphoma mean? Non-Hodgkin lymphoma can be categorised as low grade or high grade. Low grade means that the cancer cells are dividing slowly. The treatment you have for low grade non-Hodgkin lymphoma will depend on what stage it is and how much of your body is affected by the cancer. Early stage asymptomatic (you don’t have any symptoms) low grade non-Hodgkin lymphoma is usually monitored (commonly known as watch and wait). If the cancer is in its advanced stages you’ll have chemotherapy, which can’t cure the cancer but can control it for several years (this is usually measured in decades). High grade non-Hodgkin lymphoma means the cancer cells are dividing quickly and need treating straightaway. High grade lymphomas are sometimes called ‘aggressive’ but this doesn’t necessarily mean they can’t be treated. In fact, with intensive treatment high grade non-Hodgkin lymphomas often respond very well to treatment. A lot of people with high grade non-Hodgkin lymphoma go into remission (no traces of cancer). There are lots of factors involved when it comes to deciding on your treatment and what will be best for you. You cancer team will explain more about the type of cancer you have and help you make choices about your treatment. Where do the cells for a stem cell transplant come from? Where do the cells for a stem cell transplant come from? Your doctor will usually take the stem cells from your own blood before you begin high-dose chemotherapy or, much less frequently, from your bone marrow. If for some reason this isn’t possible, the stem cells will need to come from another person, usually a close relative such as your brother or sister. This is because their cells are most likely to match your own. If you don’t have any siblings or they aren’t a match, you may be able to have stem cells from a donor who isn’t related to you. For more detailed information about what happens, see Bone marrow (stem cell) transplant. How will a stem cell transplant affect me? How will a stem cell transplant affect me? The side-effects usually come from the high-dose chemotherapy you have before the transplant, not the transplant itself. This treatment affects everyone differently and the length of time it takes to recover varies. Your immune system won't be very strong after high-dose chemotherapy and you’ll be more susceptible to infections. You’ll feel very tired. You may also lose your appetite, get a sore mouth, develop fevers, and have sickness and diarrhoea. Although your stem cell transplant will help your body get stronger, this will take several weeks. Your doctor might give you antibiotics and mouthwashes to help prevent you getting an infection and you’ll probably need to have blood transfusions. In general, you will be in hospital for two to three weeks. You will need to have new vaccinations against diseases, because you will have lost any immunity you previously had. You will also be offered the annual flu vaccine. It can take about three to six months to recover fully and go back to work. See our information on chemotherapy and bone marrow (stem cell) transplant to learn more about the side-effects of both. Will I be able to have children after treatment? Will I be able to have children after treatment? Chemotherapy and radiotherapy can reduce your chances of having children or cause infertility. Some chemotherapy medicines can cause infertility, particularly if you have very high doses. Radiotherapy may also affect your fertility if you have it in your pelvic or abdominal (tummy) area. It's sometimes possible for a clinic to freeze your eggs or sperm before you start treatment. But remember it’s not always possible to freeze and store sperm or eggs before starting treatment and infertility treatments don’t always work. You can ask your doctor about your options.